The basil plant is cultivated in herb gardens throughout Europe, Asia and the Americas. It is an annual plant, meaning it has a single growing season and then dies back. A member of the mint family, basil is a prolific producer, and if allowed to flower, may reseed itself. Ocimum basilicum, commonly known as basil, may have originated in India or nearby Asian regions, or possibly Africa. The herb is mentioned in ancient Greek texts and it is thought that basil was introduced to Greece by Alexander the Great. Basil made its way to Europe and England via India in the 16th century and to America in the 17th century. Considered a medicinal herb, basil was thought to be a remedy for melancholy, a 17th century version of mild depression. Having its origins in warm, tropical regions, basil grows best in mild climates and is now common to the sandier soils of the Mediterranean regions. Basil is cultivated globally, however, and has adapted to a variety of soils and climates. Basil will thrive in outdoor gardens during the spring and summer, but is neither drought tolerant nor hardy against frost. Basil plants produce large, oval shaped leaves with pointed tips. Most types of basil produce green leaves, though the leaves of the purple ruffle basil are a dark purple and tend to be smaller in size than those of the more common sweet basil. Basil plants have a square stem that produces thin, opposing branches, creating a bushy growth habit with a height of 2 to 3 feet. The basil plant produces purple or white flowers; these grow along spikes that emerge from the center of leaf groups. Pinching off the flowering spike just as it begins to emerge prevents flowering, which in turn causes the plant to devote more energy toward leaf growth. 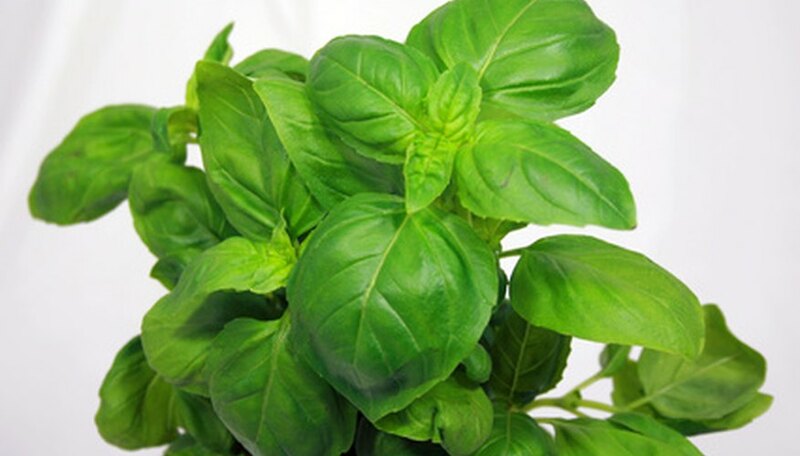 It is the leaves that are the aromatic and usable element of the basil plant. The leaves of the basil plant produce a strong scent when rubbed. Leaves may be harvested individually or by clipping a populated branch close to the stem. Basil may be used fresh or dried and retains its pungency in both forms. Basil has medicinal uses, as well as culinary. A tea made from dried basil leaves may aid digestion if drunk after meals. Basil tea may also act as a mild sedative to calm the nerves or ease an upset stomach. Sweet basil may be the more common variety of this plant, but it has many cousins. Lemon basil produces an aromatic lemony scent and imparts that flavor when immersed in iced tea. Spicy globe basil is cultivated in Mexico and the southwest United States. This plant has a globe shaped growing habit and is used in Hispanic cuisines. Thai basil and purple ruffle basil impart a tangy sweetness that pairs well with stir-fry dishes.